The Iran nuclear deal has moved front and center in the attention of the media and among policymakers since it has been a year now since the agreement was hailed as a ground breaking exercise in diplomacy. The Iran lobby has predictably cheered its perceived successes in keeping the Iranian regime in check, with regime apologists such as the National Iranian American Council in the vanguard of that cheerleading squad. For the mullahs in Tehran, the past year has yielded some fruit as a result of the deal; namely the release of badly needed cash reserves they have been able to tap for a massive shopping expedition to Russia to replenish arms used up in fighting three proxy wars in Syria, Yemen and Iraq. The deal has also helped the regime upgrade the technical sophistication of its military with the purchase of state-of-the-art anti-aircraft missile batteries from Russia, alongside new fighter jets, battle tanks and anti-ship missiles. Most importantly for the regime is the political cover the deal has provided in allowing Iran to continue its brutal crackdown on human rights at home while receiving a free pass from the U.S. and other nations since linking the deal to improvements in human rights was left out. The most recent revelation of the deal in hindsight has been the disclosure by the Associated Press of a secret side deal that grants Iran an accelerated pathway to enriching uranium back to full capacity well before the 15-year time frame outlined in the deal. The damning disclosure has wrecked the Iran lobby’s carefully laid arguments and brought on a wave of negative media coverage pointing out the irregularity in the promise of nuclear containment. The disclosure also undercuts the central conceit of the nuclear deal, which was that it could buy time to push Iran’s ability to build a nuclear weapon back over a decade and half. 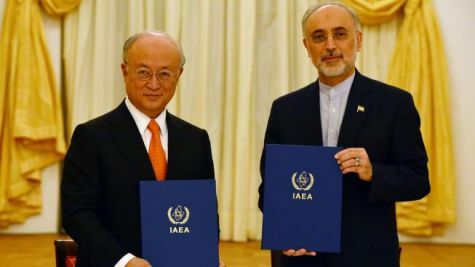 The reality is that Iranian regime has been freed of adequate international inspection and monitoring and can legally accelerate its enrichment program to produce enough nuclear material to produce several warheads in short order. When you tie in that fact with the accelerated development of Iran’s ballistic missile program, you can see the blueprint laid out by North Korea a decade earlier that enabled it to join the ranks of nuclear weaponized nations. James Phillips, a senior research fellow for Middle Eastern Affairs at the Heritage Foundation, outlined this key failing in the nuclear deal in a piece in the Daily Signal. “This concession could allow Tehran to enrich at more than twice the rate that it is now doing, even if the total number of operating centrifuges are reduced. This is a major concern because if the enrichment rate doubles, the time Tehran would need to stage a nuclear breakout would be reduced from the 12 months promised by the Obama administration to six months or less, much earlier than the administration had advertised when it was trying to sell the nuclear deal,” he added. The fact that the side deal was part of an add-on document prepared and submitted by the Iranian regime to the United Nations as part of its report on Iran’s compliance essentially codifies the regime’s ability to accelerate its enrichment program. This poses a monumental problem for the future of the world in any new nuclear negotiations—not just with Iran, but any rogue nation—since a country such as Saudi Arabia or even Egypt might be tempted to develop a nuclear capability in response to the Iranian regime and point out, correctly, it is deserving of the same concessions. A Non-Resident Iran Research Fellow at the Foundation for Defense of Democracies, pointed out this dangerous pathway for the future of nuclear agreements in a piece in the National Interest. “Key American allies that have previously limited their nuclear activities—like South Korea or the United Arab Emirates—have already noted that Iran, which has been repeatedly sanctioned for its nuclear noncompliance, has been permitted to sign a deal allowing it to develop industrial-scale nuclear capacity,” he writes. The report also correctly points that creating an artificial divide between fissile material and development of warhead delivery systems is useless since Iran has already moved quickly to possess the ability to lob a nuclear warhead across continents. This “de-linking” process sets the precedent for any other nation to demand similar concessions. The final lesson he writes about is that just because an agreement is lengthy (159 pages) does not mean it is always specific. The JCPOA contains a vague condition called “significant non-performance” under which parties can walk away from the deal. Such legalese incentivizes a devious negotiator like the Islamic State to define violations on its own terms. Jed Babbin, former deputy undersecretary of defense in the George H.W. Bush administration and a senior fellow of the London Center for Policy Research, also noted in a piece in the Washington Times how the nuclear deal has actually prevented international monitoring of Iran’s nuclear activities. “Parts of the side deals evidently bar Americans from participating in the inspection of Iranian nuclear sites. The side deals also allow Iran to inspect some of its own sites, preventing U.N. inspectors any access. To no one’s surprise, the Iranians have reported they are complying with the deal even in the uninspected sites,” he said. “In 2003 Iraq, mistaken intelligence led to war. In 2016 Iran, the lack of intelligence is leading to a false peace” he adds. The warning is explicit here. Because of the failures of the Iran nuclear deal, the world will have to suffer the consequences of a militant, extremist Iranian regime armed with nuclear weapons in the very near future and that prospect is one that the next incoming U.S. president must prevent.